There have always been parallels between my love for photography and passion for deer hunting. Just as I anticipate shooting the perfect moment on a wedding day, I anticipate the opportunity for an ethical shot while hunting. Similarly, the amount of work and number of hours spent preparing for a wedding day, far outweigh the day itself. But, it’s worth it for something so big that means so much, right? Same is true for deer hunting. All year round, long days are spent working, practicing, and just waiting for a split second opportunity that is absolutely worth it. So, when naming my business, I felt that “Shot by Chelsea” was very fitting to who I truly am. And, while you probably find yourself here for the wedding photography, I am honored that you have found yourself reading further, so I can share what hunting genuinely means to me. As a female in my 20s, words like confident, independent, and brave are actively sought after, yet scary as hell. Can you relate? But, let me tell you something. When I am walking to my stand—alone in the dark, and climbing 25 feet up a tree—alone in the dark, and sitting in the woods waiting on the sunrise—alone in the dark, NOTHING makes me feel more independent, confident, and strong. I take that feeling, bottle it up, and use it everywhere. It’s one of my biggest motivators that keeps me going back to the gym. Gaining strength in the gym, allows me to perform better as a hunter. Being a better hunter, allows me to fill our freezer with venison, that I then eat as fuel for the gym. It’s a circle that keeps me fit, happy, and healthy. I have heard people talk about mediation for a while now, and I recently realized that my version of mediating is deer hunting. I am alone, the world around me is quiet, and my mind is clear. Many of my goals, hopes, and plans started in a tree stand. You know how you have time to think alone in the car while driving? It’s like that, only your mind can wander even further and for longer. From passing young deer, maintaining the population, planting food, establishing safe bedding, and contributing financially to the bigger picture. I believe in conserving the land and opportunity that I have been given, so that it can be even better for the next generation of hunters. I consider myself pretty blessed to have been raised in a hunting household. I was in the woods squirrel hunting with my dad by four-ish, and received a youth model 20-gauge for my thirteenth birthday. 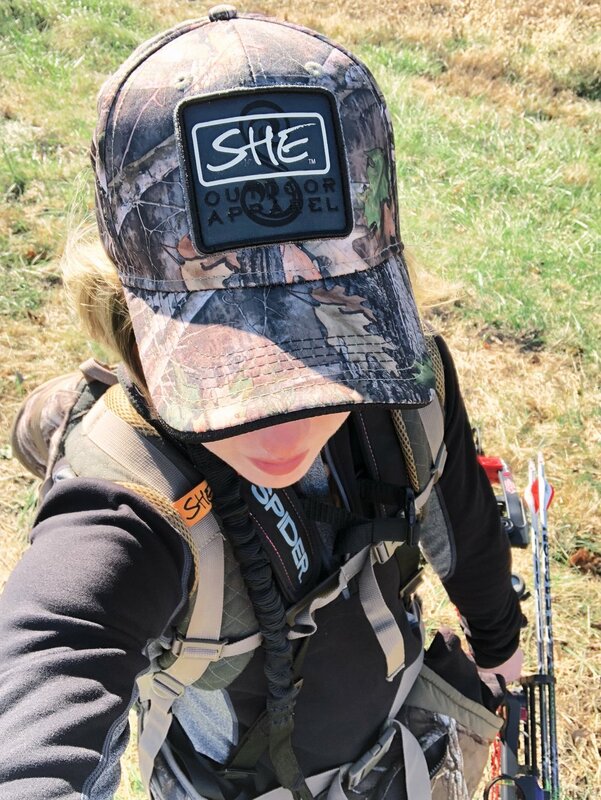 Growing up in the outdoors taught me true respect, real responsibility, and that women can do and BE absolutely anything (thanks, Dad). At nineteen, I started dating Ryan (also a passionate hunter), and hunting became even more of a social aspect in my life. It is something we have always shared, and continues to bring us closer. Interested in following along behind the scenes of my hunting adventures? Follow Shot by Chelsea on Instagram for the latest insta-stories!